It's simple to change your page background settings — as long as you don't confuse them with your site background settings. 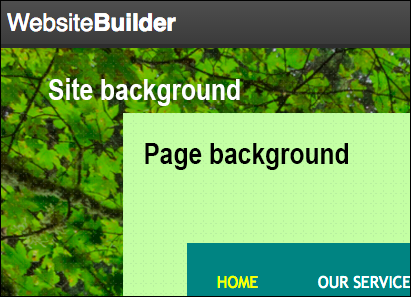 Here's the difference: the Site background surrounds the Page background. Click near the edge of any page and click Page Settings in the pop-up window. Width Use the slider to increase or decrease the width of your page, or enter a dimension. Height Use the slider to increase or decrease the height of your page, or enter a dimension. You cannot create a page shorter than its content; you'll need to first move some of the content to another page. Top position Use the slider to increase or decrease the distance of your Web page from the top of the screen, or enter a dimension. Color Click the color picker, and then select the color you want to use. Note: The change is applied to every page on your site.